Things get busy, and sometimes we all fall short, but the smallest moments can have the biggest impact on a child's life. Take time to be a dad today. 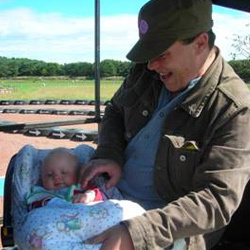 The dads club does not offer supervised contact; some fathers have been able to arrange to attend the outings as part of an agreed resumption of contact, or as a next stage after supervised contact. 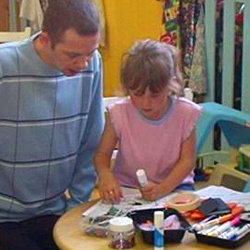 The support worker is on hand to facilitate the outings and to offer support and advice (if required by the fathers). Gilmerton Child and Family Centre and One Parent Families Scotland (OPFS) carry it out jointly with financial support from Edinburgh Childcare Partnership through the Sure Start Programme. The idea for the Dads Club emerged from observations made by Kenny Spence of fathers playing with their children in a holiday centre swimming pool. The idea evolved that rather than using centre-based group work for parenting support, a programme of activities were planned that would allow the fathers to take part alongside their young children. 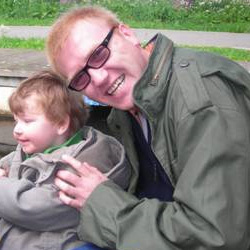 The project sought to involve single fathers with young children, both those who are the main carers of their children and those who are contact fathers who look after their children for short periods of time. This local authority/voluntary sector partnership brings together local parenting support with experience of providing assistance on financial, legal and other issues to single parents. Working together, it has been possible to develop a successful formula for involving single fathers and their children. In conversation, it was apparent that all the fathers in the group had very similar issues and concerns and from this a collective strength was nurtured and channelled into a positive direction. This allowed the individual fathers to learn through empathy, that the experiences of others were similar to their own and could reflect on this in relation to their own experiences. Apart from the outings or activities that take place on Saturdays, the project offers the dads chances to take part in activities throughout the week. These usually take place on a Monday or a Tuesday. This can range from meeting up for a coffee and chat, catching up with any problems that may have arisen and also, as we have seen the chance for peer support amongst the dads. 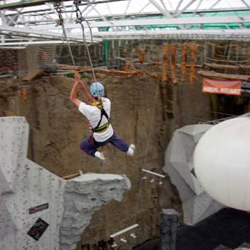 Other activities have included rock-climbing sessions at Ratho leisure centre, photography lessons, healthy cooking and eating sessios aromatherapy/relaxation techniques. These activities give the dads some time to themselves as the children are normally at nursery; it is also a chance for the dads to unwind. The fathers we have worked with have all expressed frustration at the lack of easily identifiable support services for fathers. Because the project is partly located in a lone parent support agency, there has been ready access to advice on welfare benefits, maintenance, legal issues, plus the knowledge of a wide range of other support services. Such supported referral can be a key factor in persuading fathers to engage with such services, overcoming the male reluctance to seek support. On Saturdays at 09:30am we meet at Gilmerton Child and Family Centre to catch the minibus. We have a coffee and catch up on what's been happening in the past few days before boarding the bus at 09:45am for that days activity. The Dads club outings have ranged far and wide, sometimes going to commercial visitor attractions such as Dynamic Earth, Deep Sea World or the Boness Steam Railway. Some of the best outings don't have to have an admission fee. A barbeque on the beach at Yellowcraig, nature activities at the Hermitage of the Braid and exploring the Botanic Gardens have proved equally successful for both dads and kids. Swimming is popular with visits to the Commonwealth Pool and to Leith Waterworld. These trips have allowed fathers to sample a wide range of activities, giving them ideas for outings they can repeat in the future. Planning of the activity or outing tries to take into account the needs of the families participating. For example, if that week's group needs particular support on parenting issues an activity is planned where the Dad has to work with his child/children. The feedback from the dads who use the Project is extremely positive. Participants have seen vast improvements in the behaviour of their children and in their performance at nursery. Fathers show significant gains in self-confidence and self-esteem, due both to the support offered by the project worker and also from other participants. Once the fathers gain confidence in the service they are willing to open up and disclose personal issues and problems. While this success has been encouraging, there is no obvious source of ongoing support, and we are now exploring ways in which fathers can be passed on to other agencies or services once their children are too old to take part in Dads' Club activities.